My last post was all about my McCarthy neighbor Grandma Patt. We’ve been friends for close 15 years, and neighbors for five. We both own historical cabins in downtown McCarthy, Alaska. 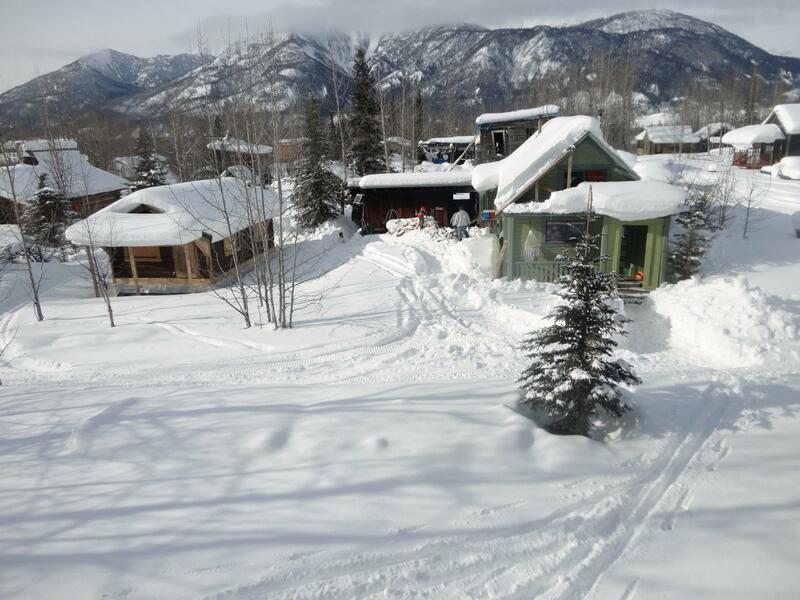 Here is a winter view of our two little places side by side. Patt spends sleepless nights dreaming about her cabin, what color should she paint the walls, how to raise the foundation, where to put woodshed, and what art belongs in her outhouse. We talk about this ALOT. 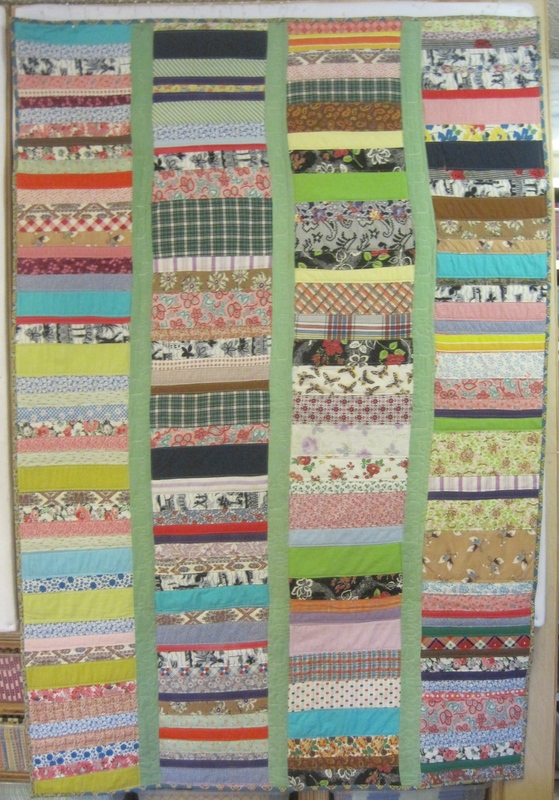 I had two old time quilt tops in my stash, and I knew they would make great additions to her cabin decor. They are nothing fancy, so my hope is that Patt would use them up. That was five years ago. 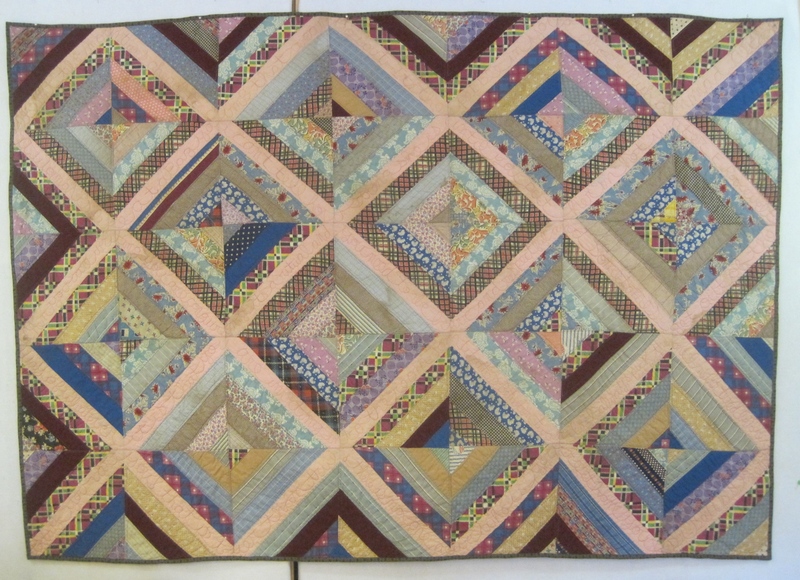 All I needed to do was quilt them. Finally, that happened this week! I wanted something simple but personal. 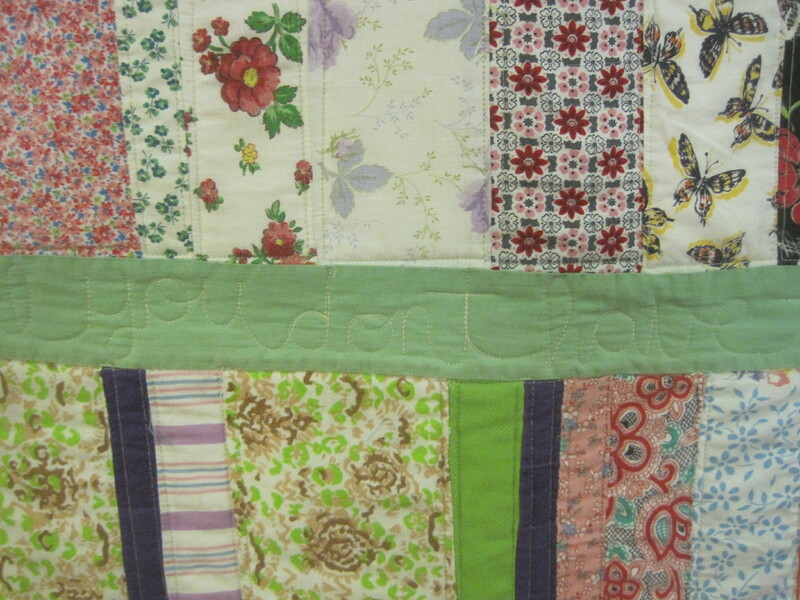 Because Patt and I met at Wrangell Mountains Center writing workshop, it seemed appropriate that I write on the quilts. I’ve been wanting to do this for a long time, just write with my long arm. 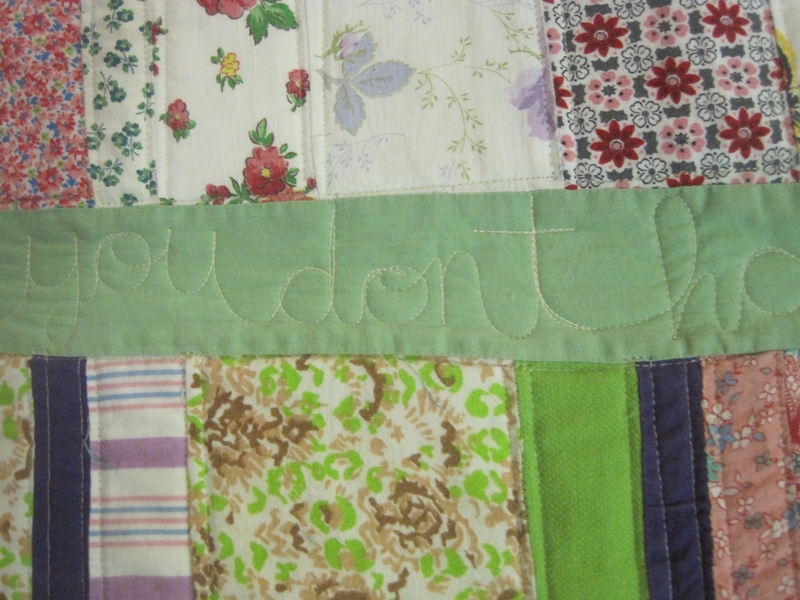 I decided that I would put famous people’s quotes on the quilts. Both Patt and I aspire to agents of positive social change, so I started with a quote about peace written by Lyndon B. Johnson. Here is the quote. 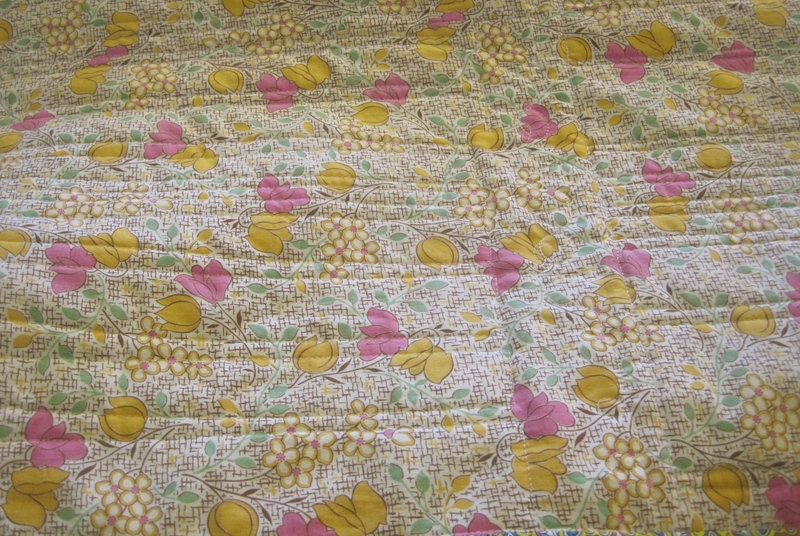 As I was writing/quilting, I started thinking that I just now put LBJ in bed with Grandma Patt. What if she doesn’t like President Johnson. He is kind of an acquired taste. This bugged me a little bit. I could see her preferring George Clooney, but I’m pretty sure he’s never said anything philosophical about the human condition that someone else didn’t write. 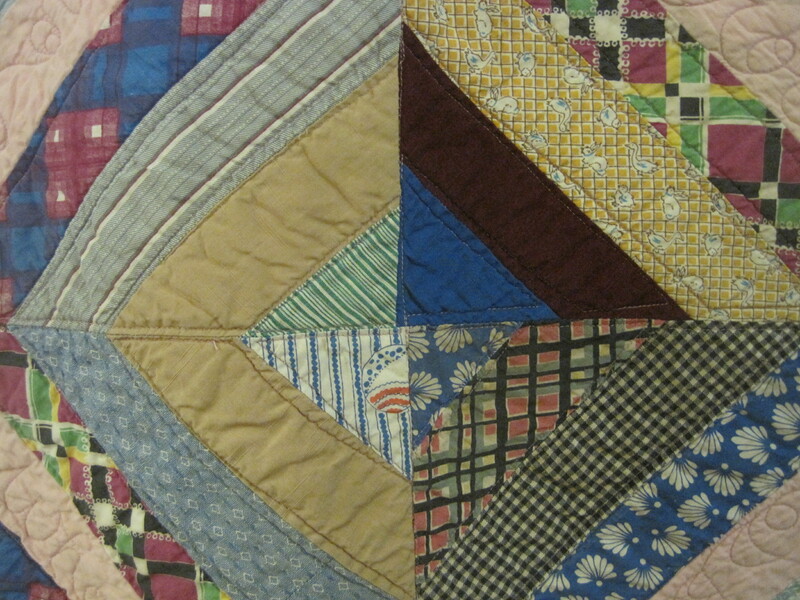 Then I thought, well, I should just ask Grandma Patt who she wants on her quilt. It is kind of personal who you get in bed with. This may have been a good idea, but anyone who knows Patt knows she would be on her deathbed sending me Facebook posts saying, “Gilda Radner is definitely in, John Lennon is out, I still on the fence about Hilary.” I do believe she made her granddaughters paint her window trim at least six times before the color was just right for all the light of all the seasons. I wanted this project done. Then I began to think about it as curated slumber party. You know that question–if you could invite anyone to dinner dead or alive who would it be? Well, this is a version of that. I knew guest number one was LBJ so that covered the old dead political guy. From there, I decided a poet would be a good choice. Here is something from Maya Angelou. How about Andy Warhol? He was always up for a party. This his contribution to the quilts. So now, I’ve got LBJ, Maya Angelou, Andy Warhol, and Grandma Patt all in one bed. This is getting fun, right? I add the greatest fighter of all time next–here is what Muhammad Ali added to the conversation. Eleanor Roosevelt is an entirely different type of fighter. Here is what she has to say. Picking the right quote, that was the right length to fill the space, and make sense for a slumber party and Patt’s personality and life philosophy was challenging and fun. I tried not to take to seriously. That’s why Mae West is next. She says. I added a personal favorite because if this party were to happen, I live next door, and I might get invited. Besides Mae West and Tom Waits might have good chemistry. AND this is a great quote for a writer, and Grandma Patt is one mighty fine writer. Tom says. And finally, for fun, and because I love his words and the fact that he did not give up–Dr. Seuss was invited to the party. “Today you are you! That is truer that true! There is no one alive who is you-er than you! There you have it. Grandma Patt’s slumber party featuring the words of Lyndon B. Johnson, Maya Angelou, Andy Warhol, Muhammad Ali, Eleanor Roosevelt, Mae West, Tom Waits, Dr. Seuss and my dear friend Patt Garrett. I know my lettering looks like a beginner’s because I am. But you know what? I think I’m going to do it again and get better. 19 Dec	This entry was published on December 19, 2014 at 7:37 PM. It’s filed under Just Plain Stories, Quilt Stories and tagged McCarthy AK. Bookmark the permalink. Follow any comments here with the RSS feed for this post. Brilliant! What a thoughtful gift. And fun project! Thank you Pam! It was really fun project. I’ve thinking about how I can do it again. best blog post yet, really lets us in on your creativity. what a gift. Thank you Mark! It means a lot to me that wrote that. Thank you. 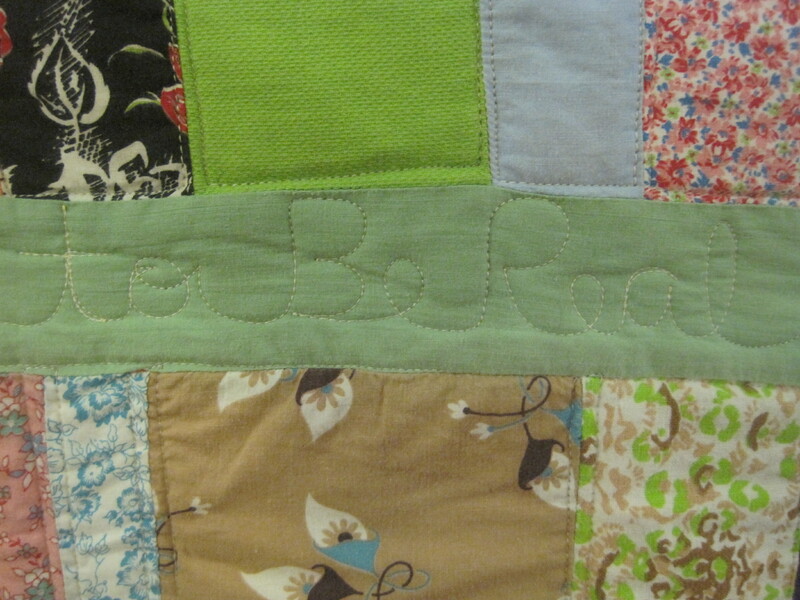 What a great idea to quilt the quotes in! Thank you Kat. I can’t believe I didn’t think of sooner! omg, I just love the slumber party you made for Patt. I wanna get in there too! I know! It’s fun to think of who you might invite to your own slumber party. Thank you Barb! Amazing good fun…love this and so will Grandma Patt! You are one good friend, Maria Shell! Thank you Bethany! I hope your holidays are good. 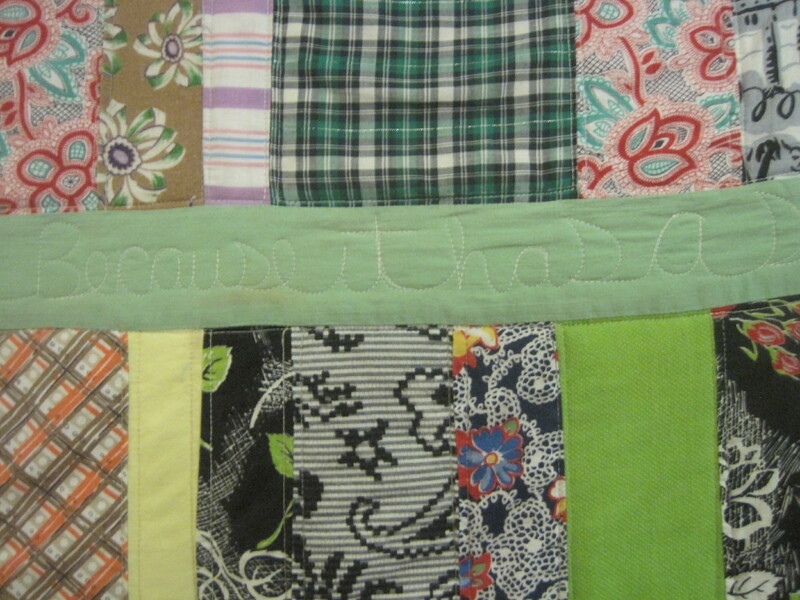 I’ve quilted words and phrases before: songs, cheers, names, etc. But I never thought of a slumber party. What a fabulous idea. Thanks. Thank you Ann for stopping by and commenting. 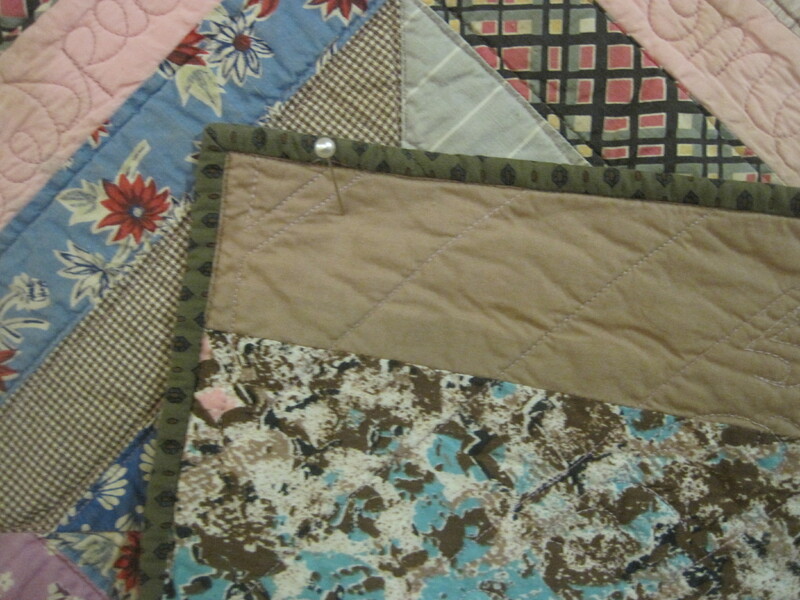 Thinking about quilting as words opens up a whole new area of quilting doesn’t it? What a fun idea!I am sure she will love it.All of your talents are merging.I’m anxious to see what’s next. Thank you Sue! I hope the holiday season has been good for you and Sarah. You gave my morning a smile with my coffee! Thank you for sharing ! ! ! Thank you Grandma Patt on Galveston Island! What a fabulous idea and thoughtful gift! Thank you Sherry–it works both ways–you (and that dear husband yours) enrich our lives too! Wonderful idea and what a great gift for Grandma Patt. What a great idea, and makes the gift even more meaningful and special for her. Yep. Our Patt is super special. Thank you Denise! Touching. Beautiful. Great selection of slumber party guests.Shows you love for Patt! Thanks so much for sharing! Sewing Machine embroidery classes with Barbara Smith yielded a sampler from we, her students who embroidered it with “Barbara Smith’s an old SEW-AND-SEW” on it. She loved seeing how we learned from her how to write our names and sign it on her gift. AND I am sure Grandma Pat will likewise love your gift. Your voice (and others’) comes through for her with this wonderful project. Great story Carole! Thank you for sharing. I hope you are all doing well for the holidays. Maria, We are in a Lisa Call class together….. Love your writing style…. and your quilting style! This slumber party idea is a great one!! Thank you Donalee. I’m glad you like them!